Richfield was always a hockey hotbed. At one point, the city regularly turned out Division I players, NHLers, and even Olympians. The high school competed in the state tournament multiple times, including making the state championship game in 1976, falling short to Grand Rapids by the slimmest of margins — 4-3. Times, however, have changed. Census data shows that the community has far fewer young families than it did during its peak years, and shifting demographics have seen the community become more diverse and less focused on traditionally popular sports like hockey. As such, the number of hockey players in the city has dwindled to the point where the high school is no longer able to field a standalone team. While it is a long way from the hockey heights achieved in Richfield’s past, hockey is making a small resurgence at Richfield Middle School. A new hockey club has sprouted for the 2018-2019 school year. 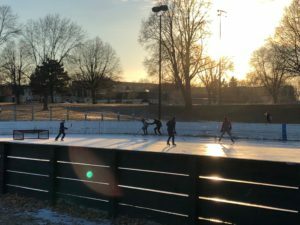 The club, which skates outdoors twice a week after school, has about 20 students, and is adding players as the outdoor rink season progresses. After surveying the students interested in the club, Parsons found that a lot of the students did not have the necessary equipment to participate. While there was no shortage of interest, many students did not have the basic skates and stick necessary to join in. Leveraging the power of the internet and the Minnesota hockey community, Parsons was able to generate several small donations of hockey equipment from across the Twin Cities. Eventually, word of the club reached Brad Maxwell, a former NHL player with the Minnesota North Stars and the current president of the Minnesota chapter of the NHL Alumni Association. Now the skaters, some of whom come from as far away as the Middle East and South America, have all the equipment needed to participate in the club. With two rinks, one for experienced skaters and one for beginners, the Donaldson Park facility has been the perfect place for the club. Will Richfield ever compete for a state hockey championship again? Not in the near future. But that doesn’t mean that the outdoor rinks can’t be filled again with kids who love the game – whatever their background might be.